Every year or so, the big 2 guitar manufacturers [Gibson, Fender], release a guitar that is designated as their latest “Wow Guitar”. You know, the ones that are pure eye and ear candy, that tempt you with selling your car to have one of your own. As guitar players, we see and hear about these guitars all the time, and sometimes it is just too simple to filter out a lot of what is put in front of us and only pay attention to the biggies. At a quick glance, the Midtown would appear to be just another hollowbody, destined to be sought after by modern alt-rockers, and blues players mostly. Upon a closer look, this guitar is pretty neat. The body is a double cutaway, constructed of solid mahogany, outfitted with two f-Holes, and your choice of either the Faded Cherry or classic Ebony finish that are easy on the eyes. Joining the body the twin ‘57 Classic humbuckers, a straightforward maser volume and tone, and the classic three-way toggle. 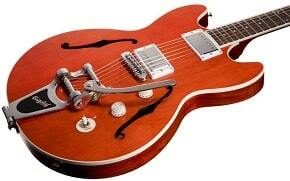 Along with this hardware is the flagship feature of the Midtown, the Bigsby Tremolo. Now pair this with the 22-fret solid mahogany neck, carved to a 60’s style, and well….we have one hell of an axe here. My favorite thing about this instrument is the hybrid concept. Classic tone and construction, modern look and vibe. This is a guitar I wouldn’t mind writing, recording, or performing with. Perfect for young players who want a tried-and-true tone, with a killer modern look. This clearly is not a guitar that has just had gold hardware slapped on it, or some billionaire guitar players name plastered on the headstock. This is a true marvel of then and now. With the minimalist, modern, and clean design, and the tone all put together, you have got to check this axe out. Note: This video also includes a demonstration of the Gibson Firebird guitar — Enjoy!